With all that chrome and studded leather, it’s hard to believe this isn’t a custom job. But then, this 65-cubic-inch beauty is no ordinary motorcycle. 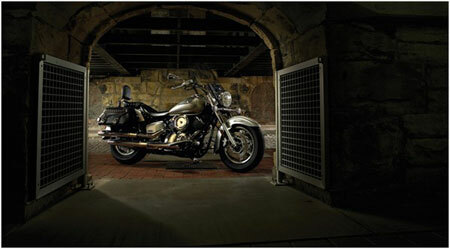 The V-Star 1100 Custom. It’s a classic, booming, big torque cruiser with a little something extra. Start with an air-cooled V-twin for effortless cruising, a 17-litre tank for all-day junkets, full rider floorboards, and much more. But when you add an adjustable windshield, passenger backrest and leather side bags, and you’re all set to roll for the long haul. With an extra-long wheelbase, you can really stretch out — just like the road in front of you. – 1,063cc, air-cooled, SOHC, 2-valve per cylinder, 75° V-twin is tuned to provide outstanding low- and mid-range torque. Maximum torque is reached at only 2,500 rpm for exceptional overall cruising performance. – Forged, lightweight pistons provide great durability while reducing vibration and reciprocating mass for fast throttle response. – Ceramic composite cylinder bore plating ensures superior heat dissipation for better cooling, reduced friction and longer cylinder life. This design also reduces weight since there are no heavy liners. – Thick cylinder cooling fins enhance the stylish look while increasing cooling efficiency and reducing mechanical noise. – Dual Mikuni BSR 37mm carburetors with throttle position sensors (T.P.S.) feature a carburetor heater and handy side-mounted air filter to ensure consistent fuel flow, great throttle response and optimum power throughout the rev range. – One-way, cam clutch-type starter decreases mechanical noise during starting. – Transistorized coil ignition is maintenance-free and ensures fast starts and great engine performance. – Automatic cam chain tensioners and special silent design cam chains reduce both mechanical noise and maintenance. – Slick shifting, 5-speed transmission is perfectly suited for both city and highway use. – Low-maintenance, chrome, exposed shaft drive delivers superior reliability and smooth performance. There are no chain adjustments or messy chain splatter to worry about. – 2-into-2 exhaust system with dual shotgun-style staggered pipes plays outstanding V-twin music and simplifies aftermarket conversion, if desired. – Classic heel/toe shifter adds versatility and enhances overall cruising comfort. – Air Induction System (A.I.S.) reduces harmful CO and HC emissions. – Numerous chromed engine parts reinforce this motorcycle’s quality and value. Low-slung, large-diameter, rigid double-cradle frame with 32° rake creates a strong, stylish machine with precise, predictable handling. – Long, 1,645mm (64.8″) wheelbase produces a long and low retro profile, with spacious ergonomics and well-balanced stable handling. – Beefy, 41mm front fork with 140mm (5.5″) of wheel travel smoothes out the bumps for incredible cruising ride quality. – Fork shrouds, top triple clamp, and new one-piece handlebar holder are chromed for 2005. – Link, spring preload-adjustable, single-shock rear suspension with 113mm (4.5″) of wheel travel lowers centre of gravity for better handling and great rider confidence. – Hidden rear shock provides that classic, hardtail appearance, while 9 steps of preload adjustment allows rider to tailor spring setting to match load, road and riding style. – Low 710mm (28″) seat height enhances maneuverability and provides extra confidence when stopping. – Dual 298mm floating front discs with twin- piston calipers provide strong, confidence-inspiring stopping power. – 282mm rear disc brake with opposed piston caliper provides fade-free stopping power. – Deeply valanced steel fenders combine timeless styling with rugged durability and easy customization. – New tank-mounted speedometer is re-designed with a large face for easy reading. Displays include digital odometer and tripmeter plus neutral, high beam, low oil and engine diagnostic indicator lights. – Forward-mounted, full-size rider floorboards with floating rubber insets enhance comfort by minimizing vibration and fatigue. – 7-spoke, cast aluminum, mag-type wheels are easy to clean and never need maintenance. They are fitted with wide 16″ front and 15″ rear tubeless tires. – Wide-set handlebars enhance both overall ergonomics and retro styling. – Comfortable, studded seats and passenger backrest provides unbeatable long-range comfort. – Medium-size, adjustable, police-style windshield enhances riding experience by keeping wind and weather at bay. – Roomy, studded soft leather saddlebags look great and provide ample storage for casual trips. – Industry-leading Star Family fit and finish features rich, lustrous paint and extensive chrome accents that create a stunningly timeless machine. – Locking compartment under side cover provides handy, secure storage for small items. – Wide, Royal Star-inspired levers provide that quality feel. – Removable passenger seat makes customization easy.